Carter's has good offer available now! You can enjoy shopping during their Friends & Family Sale. This amazing offer allows you to receive 25% discount on your entire purchase. The offer is valid online with promo code FAM25 (enter at checkout) or in-store with printable coupon. Source of the information is carter's. The offer is valid until October 3, 2016. 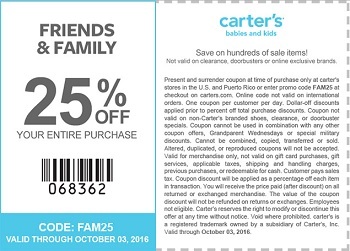 For more details see any carter's store location in the U.S.